Situated deep in Sukhumvit Soi 39, Whale’s belly Bar and Restaurant is one of the hidden gems of fine dining restaurants in Bangkok. Whale’s Belly offers great ambiance, delicious food and great service – all we usually ask for from a fine dining experience. Once we entered the restaurant, we learned immediately why it is named Whale’s Belly. A faux whale skeleton was used to decorate the ceiling and the restaurant’s blue tone gives an impression that we are in a “Whale’s Belly”. 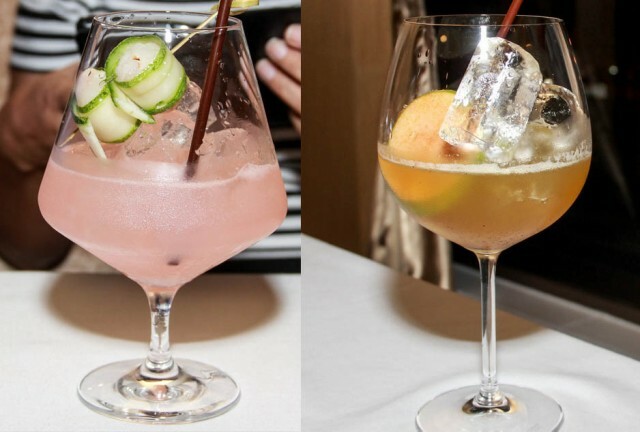 For the evening we started with some signature drinks; “Aromatic pink bitter” and “Lustful kiss” – very refreshing indeed. 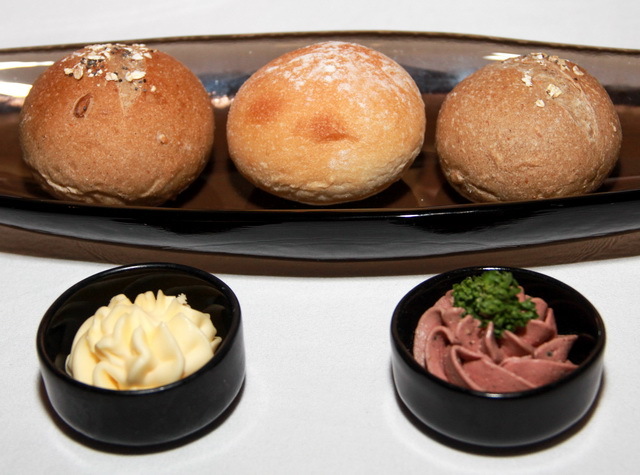 Nice warm bread with butter and liver pate while waiting for our food. 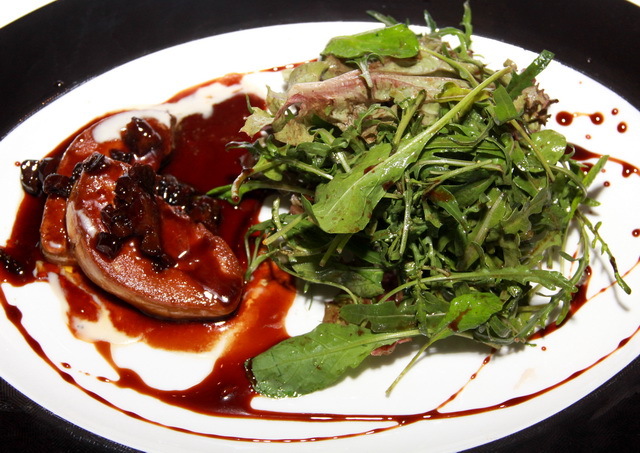 For starters we had seared “Rougié” foie gras de carnard with Moyer prune sauce served with rocket salad and aged balsamic dressing. This superb quality foie gras was cooked to perfection, a good crust on the outside and creamy in the middle. The prune sauce was a nice match as well as the rocket salad. 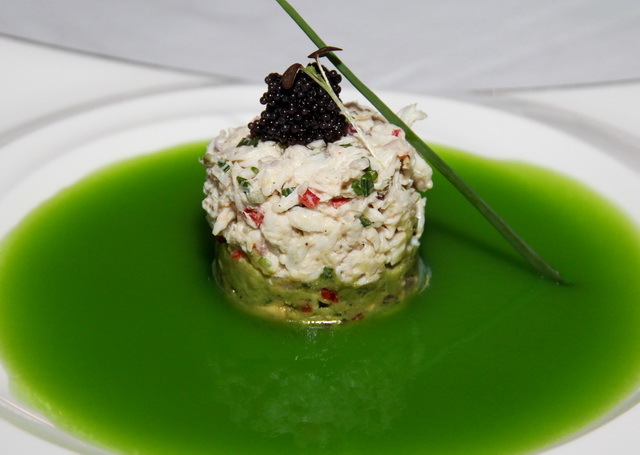 The next starter was a beautiful creation of avocado and crab salad in honeydew gazpacho. The crab was fresh and sweet, while the avocado salad was buttery. The honeydew melon cold gazpacho was a treat in itself but did not go along well with the crab. Crab and soup separately would have been better. 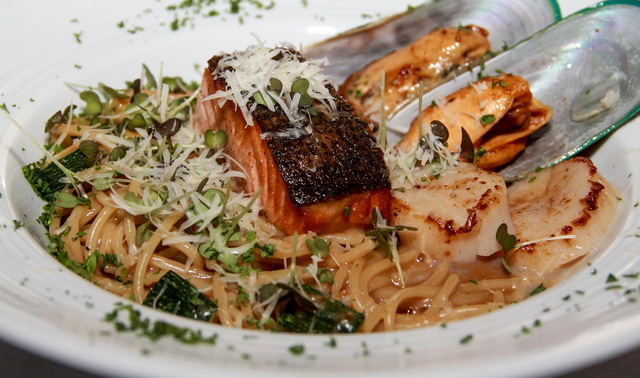 Pasta with Canadian lobster bisque sauce was a combination of many dishes put together into one; pasta, seared Hokkaido scallop, seared salmon, baked mussels, and lobster bisque. A very bold move by the daring chef and it all work out surprisingly great. This dish was very well executed, the scallop was nicely seared. The salmon cooked to perfection, skin was crispy and juicy pink in the middle, and the lobster bisque sauce nicely unites everything together. It was truly one of the best pasta dishes I’ve had this year. 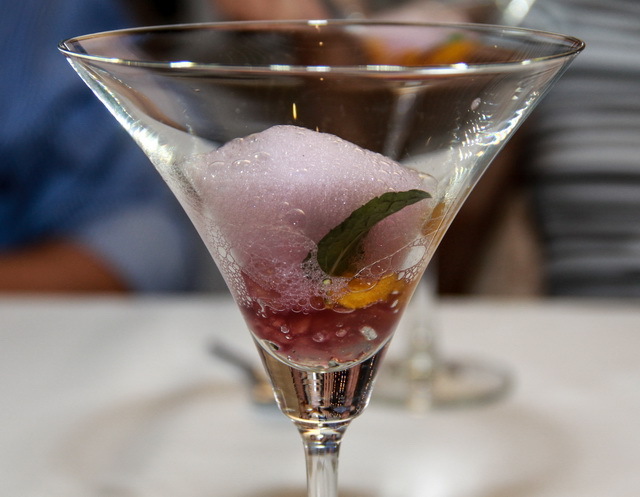 A nice fruity palette cleanser was served before the main courses. 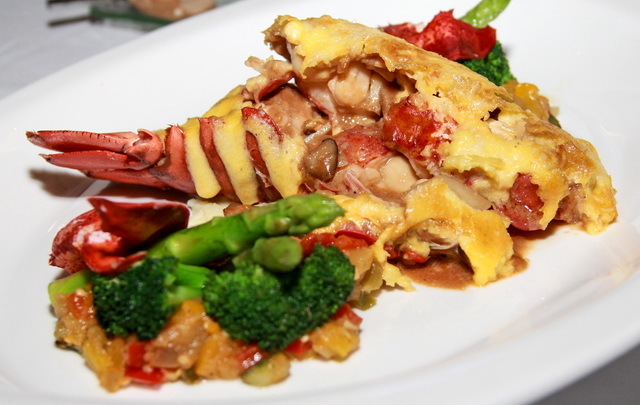 For the main course, Canadian lobster thermidor served with wild mushrooms and assorted vegetables in butter sauce. The grill lobster was sweet and cognac bisque sauce was a nice match. However, there is a little bit too much sauce on the lobster as well as in the side vegetables; but if you like butter, you will like this dish. Glaze lemon sole roulade served with potatoes with dill, parmesan chips and Pommery mustard apple vinaigrette. 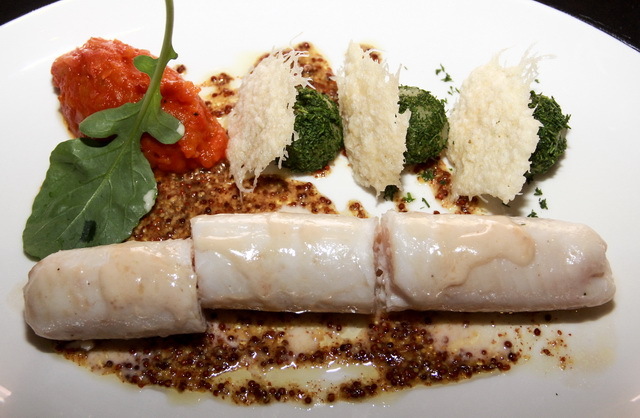 The sole roulade was sous vide, it was very delicate and matched well with the vinaigrette. This very light dish is recommended for anyone who counts calories. 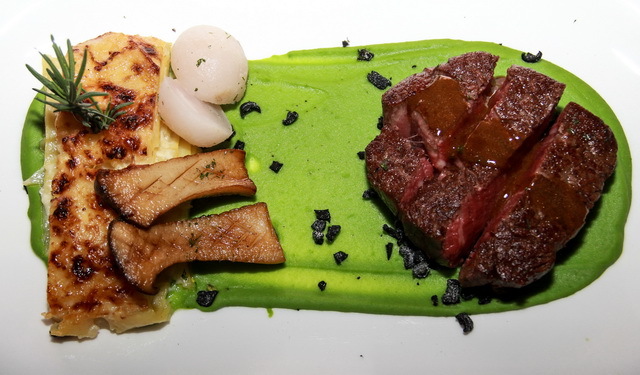 Grilled wagyu tenderloin steak served with dauphinoise potatoes (potatoes au gratin) grilled oyster mushroom, sweet pea puree and merlot sauce. 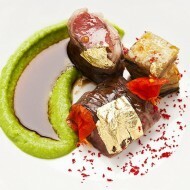 Our rare wagyu tenderloin (marbling score of 5-6) was very tender and juicy. It almost did not matter what the side dishes were but the potatoes was nice too. 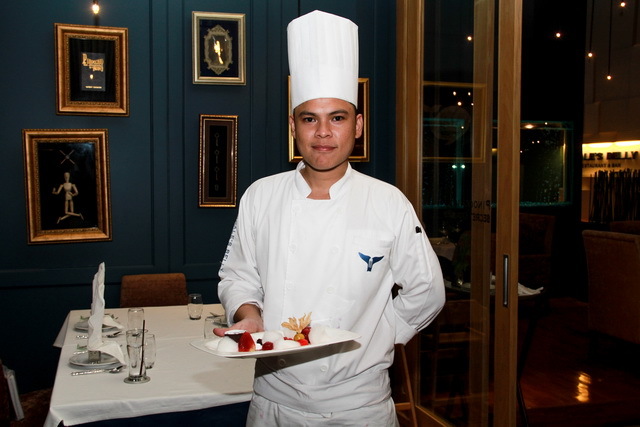 Chef Apirawit Chaopo-en (Chef Mai) the person behind the creative dishes at Whala’s Belly. 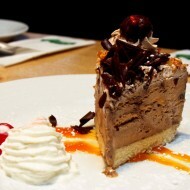 We end our evening in style by having the chef’s dessert special. 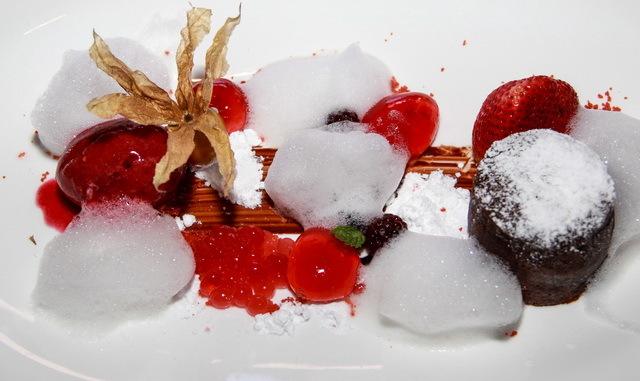 Wild mixed berry sorbet served with chocolate fondant. It was a nice combination of rich chocolate with refreshing sorbet. Whale’s Belly Bar and Restaurant impressed us with delicious plates after plates. 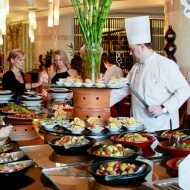 The chef’s creativity and superb ingredients certainly contribute to high quality food. 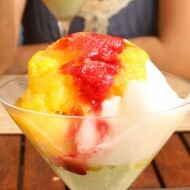 Its nice ambiance and attentive staffs are also the reasons you should give Whale’s Belly a try.